Nautilus Direct is recalling about 420,000 Bowflex fitness machines to address two safety issues. First, while being used in the incline position, the machine's backboard bench can unexpectedly collapse and break, posing a risk of injury to the user. Second, the "Lat Tower," can rotate forward and fall during use, posing a risk of injury to the user. Nautilus Direct and federal safety officials have received at least 70 reports of the backboard benches breaking, resulting in at least 59 back, neck and shoulder injuries. Nautilus Direct has received at least 18 reports of the "Lat Tower" rotating forward and falling, resulting in at least 14 back, neck, shoulder, teeth, nose and head injuries, some of which required stitches. The recalled fitness machines are the Bowflex Power Pro XL, XTL and XTLU systems with the "Lat Tower" attachment. The "Lat Tower" attaches to the back of the bench, and has pull-down pulleys attached. The name "Bowflex" and the model name are printed on the front of the machine. The machine has 10 to 14 resistance rods that extend about 48-inches high and a backboard bench that is about 36-inches long. The recalled fitness machines were made in China, Taiwan and the U.S.A.
Infomercials and specialized retail stores nationwide sold the fitness machines from January 1995 through December 2003 for between $1,200 and $1,600. Consumers should stop using the backboard bench in the incline position and "Lat Tower" on the fitness machines immediately and contact Nautilus Direct toll-free at (888) 424-3020 anytime to receive a free repair kit that will address both issues. Nautilus is contacting owners of affected machines by direct mail where the name is known to the firm. For more information, consumers can log on to the company's Web site at www.bowflex.com. Sta-Rite System 2 and AquaTools Filters and Filter Systems are being recalled because of a safety issue. The "Posi-Lok" locking ring, which secures the filters upper tank shell to the lower tank shell (see diagram below), can disengage from the lower tank shell allowing the top shell of the filter to blow off causing injury to nearby consumers. Sta-Rite has received three reports of the upper tank shell blowing off, including two reports of minor scratches and bruises to hands and/or arms of individuals servicing the filters. These modular pool filters are designed for use with above ground pools and small in-ground pools. These filters are used to remove particles from the water. The System 2 product line is sold under the brand names Sta-Rite and AquaTools, located on a decal on the upper tank shell. If the Posi-Lok locking ring has the phrase Lubricate Tank O Ring see instructions molded into it, the ring has been updated and no further action is necessary for that filter. The filters were sold at pool equipment retail stores and wholesale distribution branches or installed by professional installers nationwide from January 2003 through October 2003 for between $400 and $800. 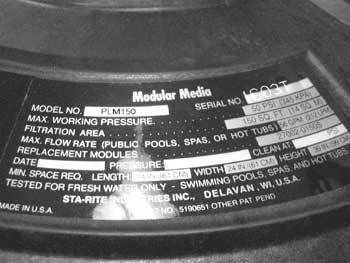 Consumers should check the filter model plates to locate model numbers and serial numbers. Consumers should not disturb their filters and contact Sta-Rite toll-free at (866) 681-9148 to confirm the identity of their filter and receive a free replacement Posi-Lok locking ring and installation instructions. In addition, Sta-Rite will reimburse consumers $10 for each Posi-Lok locking ring that is shipped back to them and provide a pre-paid box for shipping. For consumers who are not comfortable with the replacement procedure, Sta-Rite will arrange to have the affected filters professionally repaired at no cost to the consumers. General Motors is recalling about 824,000 cars built from January 1996 through October 1997 to fix a possible power steering problem. GM identified the affected models as the 1996 Buick Regal, the 1997 Oldsmobile Cutlass Supreme, the 1997-98 Oldsmobile Cutlass, Chevrolet Lumina, Monte Carlo, Malibu and 1998 Oldsmobile Intrigue cars. Some 1996 Pontiac Grand Prix and Oldsmobile Cutlass Supremes and 1997-98 Buick Regal cars are also affected, GM said. The problem involves a lower pinion bearing in the power steering gear. The pinion may separate, causing the driver to experience either an intermittent loss of power steering assist or an unintended boost in power assist, the company said. GM said it has reports of eight injuries possibly related to the problem. No fatalities have been reported. Most of the cars are in the United States, with about 70,000 in Canada.